Been a while, huh? I haven't written up anything on Beaujolais since August I think. Partly because I figured you'd appreciate it if I bundled the rest into one or two posts, and partly because I just hadn't found a few of the wines that I wanted to find. Maybe I'm prejudiced, but I just didn't want to fall back on Georges DuBouef for an example of Saint-Amour. Then one day I wandered into Moore Brothers in Mannhattan, the place with the padded jackets by the front door for customers to wear while shopping in the sub 56 degree chill. Lots of interesting stuff in there, from both big-name and obscure producers. And there's usually something to open to taste in the back, if you ask. So I'm perusing the shelves and there are three Beaujolais wines, one a Beaujolais, one a Chenas, and the last a Saint-Amour. And what's more, these wines are made by Jean-Francois Trichard, a producer I've seen David McDuff, a dude with pretty darn good taste, crow about on a couple of occasions. Sold, to the Brooklynguy in the padded jacket. Chenas and Saint-Amour are, with Julienas, the northernmost Beaujolais Crus. Totaling fewer than 750 hectares, these are small appellations. Be that as it may, they are known for light but beautifully perfumed and fruity red wines. Most growers traditionally sold their grapes to negociant producers, so a grower like Trichard stands out for making wine from his own grapes. Not sure why this is (plummeting dollar? ), but the 2006 Saint-Amour was a bit more expensive than the 2005 Chenas. The otherwise very helpful sales guy at Moore Brothers was not able to tell me if there are differences in technique that lead the Saint-Amour to cost more. The Chenas was, to my tastes, a below-average example of a 2005 Cru Beaujolais, nothing to seek out again, and the Saint-Amour was memorable, and a definite re-buy. Strange that two wines from the same producer achieved such starkly different levels of quality. 2005 Trichard Chenas, $16 (Moore Brothers). Bright cherry red with watery rims, this wine had some tomato leafiness mixed in with the red raspberry aromas. This follows through on the palate, which is not all that well balanced, and finishes with an aspartame sensation. After some time open the raspberry was more pronounced, but this wine was a bit disjointed throughout. 2006 Trichard Saint-Amour, $19.50 (Moore Brothers). A whole different story here. First of all, this wine honestly was amoungst the most beautifully colored I have ever seen. Don't care about appearance in a wine? Me neither, really. But I like to look and I do appreciate when the color is distinctive. This was gorgeous - deep rich ruby red with purple undertones, and absolutely and perfectly clear and translucent. The nose was beautiful too, with crushed strawberries and raspberries, very clean and pure. with some freshly turned soil. If you feel the need to drink the wine go ahead, but you could also wallow in the nose all night and be happy. The flavors are echoed on the juicy and well balanced palate, and lip smacking acidity balances everything out, tingles the insides of the cheeks. Imagine this: a gorgeous late September Sunday afternoon in the bucolic North Fork of Long Island, verdant fields of fresh sod, roadside patches teeming with young families picking bright orange pumpkins, the weary afternoon sun's rays coming in at an oblique angle casting a warm golden glow on everything. One of those stunning afternoons that reminds you how good it is just to be alive. The back roads of Pernand-Vergelesses? Cruising the hilly outback in the Willamette Valley, Oregon? Nope. This was the scene last Sunday when I went to the North Fork to meet Lenn and five other good people to taste a case of mature Long Island reds. You probably know already that Lenn is a true believer in Long Island wine. He has encouraged many a wine lover to explore the wines, understanding that Long Island has its own style - this is cool climate wine, not jammy-ripe and big, not typical new world wine at all, in fact. Lenn can tell you about the producers who make wine that truly reflects climate and terroir, he can tell you about experiments planting Chenin Blanc and other grapes new to the region, and he can tell you how Long Island wines improve each year as wine makers hone their craft. This guys lives and loves New York wine! So when some people claim that Long Island's Merlot, Cabernet Sauvignon, and Bordeaux-style blends are not built to improve with serious aging, well, that really perturbs him. Lenn decided to put together a tasting of 12 year old wines from the 1995 vintage. He brought together a group of people who love wine, and who with the exception of myself, work in the Long Island wine industry. How would these wines hold up? What brand of pleasure would they offer? They held up beautifully, and offered complex and varied pleasures, I am happy to report. Complex secondary aromas and flavors had emerged, and we had lots to talk about and enjoy. Tasters included Joe Watson, owner of Vine, the wine bar and cafe in Greenport, Chris Watkins, Director of Operations at Roanoke Vineyards, Tracy Ellen Kamens and Jared Skolnick of Grand Cru Classes, Lenn, and myself. We gathered at the renovated former goat cheese farm that houses the Grand Cru Classes tasting room in Mattituck. Let me begin by telling you how utterly impressed I was with the way Tracy and Jared set up the tasting. Completely professional and totally comfortable. I had my own "place mat" with 12 numbered circles, one for each stem. There was plenty of water and bread, and I had my own little spittoon. If their wine classes are anywhere near as great as the way they host a tasting, it will be quite difficult to get a reservation. Okay, now about those wines. They were very much alive, with broad and interesting flavors, sometimes delicious, sometimes lacking a bit of body, but in general, vibrant and alive. At about 13% alcohol or lower, they brought food to mind, from venison, to salmon, to tapas, to steak. And a sense of place? I definitely got it. There was a lingering menthol/eucalyptus/herbal quality that remained in the mouth and the nose long after swallowing many of these wines. And a spicy character in the initial aromas. Chris Watkins said that Long Island is less about opulent fruit and more about spice, and I understood what he meant tasting the wines. He also explained that 1995 should have been a tremendous vintage in Long Island, with perfect weather, but back then people didn't let the grapes hang as long as they do now, they didn't make the most of it. That might explain the lean nature of some of a few of the wines. First we tasted one Pinot and one Cabernet Franc, both by Hargrave, the founding winery in Long Island. Louisa Hargrave sold the vineyards a while ago and now Castello di Borghese makes wine from vines. Then we blind tasted three Cabernet Sauvignons, three blends, and four Merlots. Nice! The Pinot was a welcome surprise. There was obvious bricking in the color and not just at the rims, bricking at the core of the wine. The nose was quite alive though, with wispy hints of stewed cherries, caramel, and dried figs. The palate was just lovely, with more cooked cherries, some minty notes and nice pomegranate acidity at the finish. All of the tannins had melted away and the wine was silky and fine. I wanted to steal away with this bottle, tuck into a plate of lean venison with dried cherry compote and enjoy it all evening long, all by myself. Sigh, not to be. The Cabernet Franc was not as impressive, but I liked it a lot, probably more than anyone else at the table. I enjoyed the mediciney character of the nose and palate, and the hints of leather and dried flowers. Our first Cabernet turned out to be from The Lenz, one of the standard bearers on the Fork. This wine, like almost all that followed, had a youthful appearance with no signs of bricking. The nose was minty with some dried rose petals, very inviting. The palate was dark and plummy with mushrooms, leather, and earth. Still kind of tannic - maybe it could continue to improve? It was my personal favorite of the three Cabs, but some folks preferred one of the other wines - they were all vivid and interesting. Pellegrini produced the second Cabernet, and it was quite a dark and young looking purple. The nose was cocoa, plum, and leather, with palate staining dark fruit and that wintergreen finish. The third Cab was a Paumanok. Also dark purple to the core. I wasn't getting much on the nose, and I found the palate to be a bit green, maybe the fruit was not fully ripe. Others found interesting flavors in this wine, though, which just goes to show that wine is not like math where this is one correct answer. There was one wine from our blended flight (although technically, wines labeled "Cabernet Sauvignon" or "Merlot" may contain up to 25% juice from other grape, so some of the Cabs were probably blends) that stood out for me. It was my favorite wine of the tasting, the Pinot aside. This was the Pellegrini Encore. A youthful ruby color and a rich and inviting nose that balanced high toned fruit, dark cassis, and fresh herbs. The palate was simply classic Bordeaux-blend, with juicy dark fruit, cedar, caramel, an herbal quality, and some lingering raspberry on the finish. The wine was clean and pure, and felt great in my mouth. How happy was I when at the end of the tasting, I got to take this one home? Very happy. It was beautiful the next evening too, by the way, with roast pork chops, fried green tomatoes, and a salad with farmer's cheese dressing. The Jamesport blend had a nose of cocoa and cassis, and a fresh tasting palate of plums, tobacco, some cocoa, and something floral underneath it all. Bedell Cellars Cupola blend was the darkest wine of the flight, with an earthy and floral nose. The palate was pretty grippy, I thought, with nice dark fruit and spices, and something like an aspirin/powdery feeling on the tip of the tongue. By the time we got to our flight of four Merlots, we had been at it for over three hours, and our palates were probably were not as sharp as they might have been. Also, Lenn was completely drunk by this point, which was kind of surprising. Usually he spits, but whattaya gonna do? The Merlots as a group stood apart from the other wines to me in their aroma profiles. These wines were about smoke and tar, chocolate and spice. I was really impressed. I had no cler favorite, but I very much enjoyed the Wolffer Estate (our only South Fork wine) Merlot. It had a bit of bricking in the otherwise dark purple color, with a nose of spices, cocoa, vanilla, and some flowers. The palate was dark plum, still sappy, some cedar, and the flavors that carried through from the nose. Nicely balanced with firm tannins, a slight bitterness on the finish. Maybe a tiny bit hollow somewhere in the mid-palate, but I really liked this wine. I also liked the Bedell Cellars Reserve Merlot, a wine that to me was quite different from the others. It was a more translucent ruby with hints of orange at the rims, and a nose of nutmeg, smoke, and bloody meat. The palate was clean red fruit with more meat. It reminded me of some grenache-based wines from the southern Rhone. It was very drinkable with good balance. Jamesport's Churchill Merlot was also nice, with black tea aromas to go with the tar and smoke on the nose, and cocoa and leather on the palate. This wine had a somewhat lighter body. The Lenz Merlot had hints of orange at the rims and powerful brett on the nose, also some orange peel and eucalyptus. The palate was spicy with chocolate, plums, and grainy tannins. And I was of course kidding about Lenn being drunk. He's a consummate professional who would never do such a thing at a tasting. The beautiful thing about going to the Martin Scott Portfolio Tasting, for me, is that I get to taste Burgundy wines that I have never before tasted, and that in all likelihood I will not taste again unless I go next year. None of my friends drink Remoissenet at home, unless they're hiding it from me (which would be wise, I suppose). Such an impressive lineup of producers, such a pleasure to taste through the wines. Such a great way to learn about the character of the '05 vintage in white Burgundy. A comment before getting started: I continue to notice that I seem to prefer the style of the 2004 vintage over the 2005 for whites in Burgundy. Not knocking the '05s - they're very tasty, and since I will never taste the highest level of Grand Cru wines, so take this with a grain of salt. The leaner, crystalline, taut style, but with lovely fruit all the same, is more satisfying to me than the big, fleshy, and robust '05s I have tasted. Lucky for me, since you have to pay far more for the same wines in '05. Here are my notes, same system as last time, with wines scoring "8" or above being noteworthy to me. I do not have retail prices, but this time I will indicate if the wine is inexpensive (I), moderate (M), expensive (E, meaning over $50), or Hedge Fund Manager Style (HFMS). 2005 Domaine Bernard Moreau et Fils Chassagne-Montrachet (7+, M) Nose not revealing much right now, pleasant white fleshy fruit and a light texture. 2005 Domaine Henri Boillot Puligny-Montrachet 1er Cru Clos de la Mouchere (9, HFMS) Lovely floral nose, some stone fruit too. Intense palate, fills the mouth, perfume of citrus and minerals after swallowing. Not elegant, but not overwhelming either. Safely on the intense side of the spectrum, but very well balanced. 2005 Maison Henri Boillot Bourgogne (7+, M) Perfectly pleasant. This is the negociant arm of Domaine Boillot. 2005 Remoissenet Pere & Fils Puligny-Montrachet (8, E) Impressive lemon oil and flowers on the nose, palate still shy,with fresh fruit poking its head in and then withdrawing, but seems to have nice minerality and texture. 2005 Dujac Fils & Pere Puligny-Montrachet (7+, E) Flowers on the nose, also oak. Oak distracting me on the palate too. 2005 Domaine Dujac Morey Saint-Denis (7, E) I just didn't care for this - lots of wood and associated cloves and spices, but no fresh fruit. Maybe I got there right after they opened the bottle. 2005 Domaine Simon Bize & Fils Bourgogne Chardonnay (8, I) The value white of the tasting without question. Fresh nose of flowers and lemon oil. Fresh fruit, great pure feeling on the palate. Highly drinkable. This is about $15-20 a bottle, and would make a great drink-now white Burgundy for the next year or so. 2005 Domaine Simon Bize & Fils Beaune 1er Cru Aux Vergelesses (7+, M) Tight nose not revealing much, but flashes of perfume. Citrus on the palate, but shy fruit. Seems good, hard to tell at this stage. 2005 Domaine Jean Noel Gagnard Chassagne-Montrachet Les Masures (7+, M) Flinty nose, hints of flowers. Mineral palate, good purity. 2005 Domaine Patrick Javillier Bourgogne Cuvee des Forgets (7+, I) Very light and forward wine, citrus flavors. 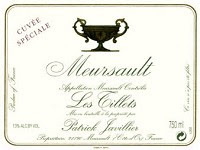 2005 Domaine Patrick Javillier Meursault Les Tillets (8+, M) Really impressive. Tight nose, but reveals roasted nuts and hints of flowers. Viscous texture, almost oily, but with good acidity to balance. Fleshy and floral palate. Yum. 2005 Domaine Pierre Morey Bourgogne (8, M) White flowers, light palate with stone fruit and some lemon, highly drinkable. 2005 Domaine Pierre Morey Meursault Les Tessons (8+, E) Excellent. Nose of white flowers, ripe fruit, good acidity, intensely mineral. Just delicious. 2005 Morey-Blanc Auxey-Duresses (8+, M) Really impressive Auxey. Deep nose of fresh flowers and lemon oil, medium weight palate with good fresh fruit. Maybe not for long term, but so delicious now. Morey-Blanc is the negociant arm of Pierre Morey. 2005 Morey-Blanc Saint-Aubin 1er Cru (7+, M) Simple but pleasant. 2005 Domaine Leflaive Macon-Verze (7+, M) I know that this wine is supposed to be so good, but just didn't do it for me. Pleasant nose, but somewhat bitter on the palate, not balanced. 2005 Domaine Leflaive Puligny-Montrachet 1er Cru Clavoillon (8+, HFMS) Toasty roast nuts on the nose, complex and weighty palate with flowers, more nuts, good acidity, purity. Whites, like reds in Cheverny, must be blended. Sauvignon Blanc tends to dominate the blends, the balance typically Chardonnay. I don't drink much Sauvignon Blanc. I find most of them to be super pungent and intense on the nose. Finding a balanced Sauvignon Blanc is not easy, something that doesn't smack me with grassy cat-pee aromas, something that compliments food. I won't lie to you folks, I've had no success in New Zealand, and mixed results in California. I really want to like Long Island Sauvignon Blanc but I just don't, so far. Lenn is going to help me find the right wines, I hope. Not enough experience with white Bordeaux do say anything meaningful. When I want Sauvignon Blanc, I turn to - you guessed it - the Loire Valley. Sancerre and Pouilly Fume are the big shots for Sauvignon Blanc in the Loire Valley, but great wines hail from appellations like Menetou Salon, Quincy, Touraine, and tiny Cheverny, and at about half the price. This little gem from Domaine du Salvard, without question an under $15 beauty, should be part of your fall white wine collection. It's a bottle you can open without occasion on a Wednesday night, or to surprise fellow wine lovers as an aperitif or with a seafood course. And it's elegant and balanced enough to be enjoyable as an aperitif. 2006 Domaine du Salvard Cheverny, $14 (Prospect Wine Shop, but Wine Library has it for $11). Vibrant aromas of lemon peel, grass, and wet stones - tangy, but not overwhelmingly so. The nose will seem refined and mellow if you're used to the New Zealand stuff. The flavors have really good focus and purity. There is citrus and plenty of minerals, and even a touch of that gooseberry flavor that I associate with Sauvignon Blanc. Zippy acidity balances the fleshiness of the wine. This is so drinkable, and at 12.5% alcohol you can have a glass while cooking, another with dinner, and another while brushing your teeth before bed. If I were you, I would find two friends and split a case of this wine - four bottles of this for $44 is simply ridiculous. I bought four bottles, and I find myself conserving the wine now, like I do more expensive bottles. I am saving my last two to impress my wino friends who I bet will think it a pricey Sancerre. I will let you know the results of that experiment once it's completed. I had the distinct pleasure of going to the Martin Scott Portfolio Tasting last week at the New York State Theater at Lincoln Center. That's right, Lincoln Center - what a wonderful and grandiose location for such a great tasting. There were LOADS of wines to taste from all over the world, all of it serious stuff. I know that some people, like Alder of Vinography, can taste every wine at one of these things. I cannot enjoy myself that way. I like to look a the different bottles at each table, to talk to the person pouring if they work at the winery, to consider each wine slowly, to take my time, in other words. Bruno Paillard's wines were my favorite Sparkling wines of the event. I was truly surprised at how good they were, the whole lineup (almost) was really impressive. Technically not "grower" Champagne because they buy grapes, but this is not your typical big house Champagne. NV Bruno Paillard Champagne Blanc de Blancs Brut (9) Electric nose of white flowers. Elegant palate, fresh, lively, just delicious. NV Bruno Paillard Champagne Brut Premier Cuvee (8) More weighty on the nose, thicker texture, nice red fruit behind the toast. Also very good. 45% Pinot Noir. Premier Cuvee means first pressing, in this case. NV Bruno Paillard Champagne Brut Rose Premier Cuvee (8+) Solera system for the Pinot Noir still wine used here, and the complexity is evident in the nose and palate. Berries and flowers, but elegant and dry. 1996 Bruno Paillard Champagne Brut (10) The most exciting and delicious Champagne of the tasting for me. Haunting aromas of honeyed citrus, some wax, some nuts. What a nose! The aromas follow through on the palate, but the wine is not honeyed, as the nose would suggest. So silky, such complex and well balanced flavors, so powerful and elegant. This spends 9 years on the lees. I want this wine in my cellar! NV Delamotte Champagne Brut (7+) The second wine of Salon. Pleasant, but next to the Salon, nothing special. NV Delamotte Champagne Brut Rose (7+) Nice fruit aromas, a bit clunky. 1996 Salon Champagne Brut Blanc de Blancs (9+) White flowers, citrus, roast nuts on the elegant and lively nose. Sort of oily mouth feel, perfectly balanced. This is just delicious. I found out afterwards that this stuff sells for about $350 per bottle. C'est la vie, eh? NV Champagne Beaumont des Crayeres Brut Grand Prestige (7+) Weighty, nutty nose, sweeter palate. NV Champagne Beaumont des Crayeres Brut Rose (7) Cheese on the nose - yes, cheese. Funky, with some flowers too, and an od palate. Could this have been off? 2002 Hermann J Wiemer Blanc de Blancs (8) I love this NY State winery's Rieslings, and it was fun to taste the sparkling wines. Weimer just changed hands - let's hope the quality stays high under new ownership. Fresh nose, yeasty, honeysuckle. Slightly sweet on the palate, but balanced. Is there Riesling in this wine? In any case, I liked it. 2003 Hermann J Wiemer Blanc de Noirs (7+) Made almost entirely of Pinot Noir, this was strawberry scented and pleasant. Not terribly complex or exciting, but yummy. NV Mirabelle Brut (7) Mirabelle is made by Schramsberg, their entry level wine. This was too sweet for my tastes. 2004 Schramsberg Vineyards Blanc de Blancs (8) I was excited to try Schramsberg wines, as I understand them to be the creme de la creme of American sparkling wine. This Blanc de Blancs had an elegant floral nose with some citrus too. Even though the palate is more weighty than I expected, this is still highly enjoyable. 2004 Schramsberg Vineyards Blanc de Noirs (7+) A little funk on the nose, sweet berry and brown sugar flavors. 85% Pinot Noir in this one. 2004 Schramsberg Vineyards Brut Rose (7+) 66% Chardonnay here. Cheese and berries on the nose, good fruit with a nice light finish. 2000 Schramsberg Vineyards Reserve (8) 70% Pinot Noir here. Very nice nose of roast nuts and citrus. A bit weighty on the palate, but the flavors of sweet cherry are just lovely. 1999 J Schram Brut (8+) This is Schramsberg's top label. The wines are quite limited. This one is mostly Chardonnay, and had a piercing nose of flowers and minerals, some citrus too. Delicate palate echoed those flavors. Seemed like it could continue to improve with cellaring. Very impressive, the first Schramsberg wine I tasted that combined great texture and elegance on the palate with fine aromas. 1998 J Schram Brut Rose (9) Sweet berry nose with fresh flowers. Well balanced palate of red fruit, some citrus hints, and minerals. Stayed in my mouth and nose long after swallowing - this is really good stuff. Too bad it's basically impossible to find. My fascination with Champagne is growing, sadly for my wallet. I've been controlling myself, honestly, but let's just say that if I have a good night in my weekly poker game, lately it's a bottle of Champs that I treat myself to. I tasted some wonderful stuff the other day at the Martin Scott trade tasting, but that's for next time. This time, it was another excellent selection from Terry Theise. There is nothing that I can tell you about Jean Milan Champagne that you cannot read yourself on pages 19 and 20 of Theise's highly informative and entertaining catalog. I will say this: apparently the wine I tasted (and LOVED) is the "lowest" offering from the Domaine, the wine from young vines, the sweeter wine that the Domaine wants to phase out in favor of an older vines Brut. I can only image the "higher" wines - I hope to taste them some day. This one was, to my tastes, spectacular. It fared quite well in Eric Asimov's recent Champagne tasting too. We opened it to celebrate my last day at my old job. It was a beautiful late summer Friday night an we enjoyed the wine as an aperitif while grilling and hanging out on the deck. Hard, this life, isn't it? NV Jean Milan Champagne Brut Carte Blanche Grand Cru, $40 (Prospect Wine Shop). This is a Blanc de Blancs, a Champagne made entirely of Chardonnay grapes. We immediately noticed the differences in texture and weight, compared with the recent Champagnes we've tasted. This had a lighter mouth feel, a more elegant and lacy structure, and the lingering sensation in the mouth after swallowing was light and floral, as compared with the fruity feeling from a Champagne that is about half Pinot Noir. Could be just this particular bottle though, I do not have anywhere near enough experience with Blanc de Blancs to make definitive statements. This wine had a rich golden hue, a bit of lemon yellow in there. The nose was really exciting, with roasted nuts, citrus fruit, and flowers. It became more expansive over the first half an hour open. But it was the overall experience of the wine on the palate that made me go out and buy more. The feeling of the wine in the mouth was of light and elegant flowers and a bit of toast, but hanging on a sturdy core of minerals and acidity, just electric and racy. This contrast is, to me, what is thrilling about Champagne. And with this installment of Wine Blogging Wednesday, we enter the fourth year of monthly community wine blogging, a tradition Lenn thoughtfully brought to the wine blogging world. This month Dr. Vino is our host, and he has asked us to taste an indigenous grape variety, something less common perhaps. I love French wine, but the good doctor ruled out what he called "the big six grapes" from France, namely Riesling, Chardonnay, Sauvignon Blanc, Cabernet Sauvignon, Merlot, and Pinot Noir. That rules out a lot of wine. Aha, but one of my absolute favorites grapes (behind only my beloved Pinot Noir) is not on that list. Chenin Blanc is, in my opinion, the superstar white grape of the Loire Valley. Yes, Sancerre and Pouilly Fume produce highly regarded Sauvignon Blanc. But it's the Chenin Blanc wines that are so shattering to me. Amazing dry and off-dry wines from famous ouvray and Savennieres, and upstart appellations such as Montlouis sur Loire, Anjou, Jasnieres, and Coteaux du Loir. Sweet wines equal to any in the world from Quarts de Chaume and Bonnezeaux. And almost always a good value, too. So in honor of WBW 37 I tasted wine made from France's Chenin Blanc. Three from Savennieres, each a dry wine made entirely of Chenin Blanc, each of them made by one of my favorite producers, Domaine du Closel. Closel produces three cuvees each year (that make it to the US): La Jalousie (a mineral driven wine that tends to be approachable at a young age), Les Caillardieres (usually off-dry, also hits its stride while young), and Clos du Papillon, the majestic wine from the butterfly shaped vineyard. Wines from Clos du Papillon can be enjoyed while young - they are always complex and tense, with unusual and thrilling flavors, but they are most impressive with age. In most vintages, Closel's Clos du Papillon improves with upwards of 10-15 years in the cellar, and in better vintages the wine can age like a vampire - it just will not die. I tasted two new releases and one mature wine, but probably too mature, as we shall soon see. 2005 Domaine du Closel Savennieres La Jalousie, $20 (Chambers Street Wines). Aromas of yellow apples and flowers, quinine (like in tonic water), and honey, with definite minerality. Yes, this is not your typical white wine nose - this is dry Chenin Blanc from Savennieres baby, and you should check it out! The palate is pure fresh rainwater, with a light texture, somewhat tense mouth feel. There are stone fruit flavors and also more quinine and minerals, and the finish is a bit spicy. This improved in the glass, so it might benefit from a year or so of aging, but that certainly is not imperative - this is beautiful right now. You could pair this wine with hearty fish dishes, like blackfish roasted in parchment paper with tarragon and market cherry tomatoes. Or lighter, simpler chicken dishes - maybe whole roast chicken with lemon, let's say. I personally think that if it's your first time with Savennieres, it's more fun to sip this on its own, as you get the full Savennieres effect, unfettered by the distraction of food. See what it's about, then have it with dinner another time. Whatever, do what you want. Who am I to tell you how to drink your wine? 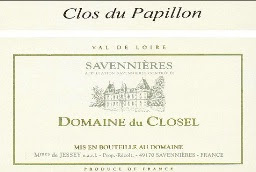 2005 Domaine du Closel Savennieres Clos du Papillon, $33 (Chambers Street Wines). Pumping it up about five notches. Darker gold in color, shimmering. Waxy nose, with lanolin (like in baby diaper gel) and roasted nuts. An amazing nose, and this is just a baby! When the flowers come, I can't even imagine how interesting this wine is going to smell. Melon and citrus fruit flits in and out. Weighty on the palate, but in a good way, firm and dense. There are apricots, quinine, and lanolin flavors, and hints of citrus, but it's really too young to tell what's going on with this wine - it needs more time. So pure and clean though, and so interesting already. Thankfully I have several bottles that will sleep for an extended period. Pairing food with a Clos du Papillon is easy in that it is almost impossible to overwhelm the wine. This particular wine is the only one I have come across that I would serve with steak - it's got that kind of power. It might overwhelm lighter shellfish dishes, but other than that - chicken, pork...just give it a shot. 1995 Domaine du Closel Savennieres La Jalousie, $29 (Astor Place Wines). What? A 12 year old Jalousie? Isn't that meant for young drinking? And from a middling vintage at that? Age the 2005 Jalousie if you want as an experiment, but why the 1995? Because they can - that's my only guess. All that notwithstanding, I had high hopes for this wine because great producers make great wine, even in middling vintages. And Chenin Blanc tends to age well, so let's see. Nope, this was just too old, the color of honey, with a sherry-like smell. BrooklynLady couldn't go near it, and she'll drink Closel wines instead of orange juice in the morning, if you let her. Not corked or otherwise flawed, just over the hill and essentially undrinkable. And Astor should have tasted it and come to the same conclusion before choosing to sell it. After much argument, they gave me a store credit, I am happy to say. I love baseball, and as any true baseball lover, I naturally listen to the Yankees on the radio. Late in the game between the Yanks and the Seattle Mariners last night (Yanks win 10-2), sandwiched in between ads (that's short for advertisement, for those of you not in the business) for Foxwoods Casino and Wendy's, I heard an ad for Palmer Vineyards on the North Fork of Long Island. "...come taste our award winning wines while enjoying our beautiful setting on Long Island's North Fork. Plenty of games and activities for the kids, and we provide designated drivers. So come to Palmer Vineyards..."
I laughed out loud. Maybe they don't actually plan on ensuring that all of the visiting adults drink enough wine so as not to be able to operate a moving vehicle. But then again, it was a late inning radio ad on the Yankee game. Maybe they think that audience wants to gulp the wine, not just taste it. Who knows what they meant, but it was funny at first, and then I couldn't help but mentally file away Palmer wines (without ever having tasted one, in my recollection) as plonk for the swilling designated driver set. Not Palmer's intention, I bet. And before you say "well you're not their target audience Brooklynguy," with that smug smile on your face, you're wrong! I am their target audience. I listen to the Yanks on the radio, I like playing poker, I don't eat at Wendy's but I do love a good burger, and I'm a 25-45 year old male married with a kid who drinks wine. And most importantly, like 96% of us (all statistics made up, yet true) who were listening last night and who are curious about wine...I am not flattered by the assumption that I must actually get drunk to enjoy a wine experience. C'mon Palmer, let's see if you can convince me to spend my money and time on your wine NOW. Maybe if you offered one of your designated drivers to take me to a designated wine shop and then if that driver also acted as the designated funder of my bottle, I would consider it. That was supposed to be a joke, I am not angry at Palmer. Really, I just think it was a silly ad. The wine market is growing here in New York, and in general, and the wine industry should not make the mistake of underestimating us as consumers. Sure, a small few of us are wine gulpers who will get drunk at a tasting room, but why would you target them in your ads anyway?